Facebook showcases some of our UC Merced history in ground breaking, building and expanding as well as events on campus. 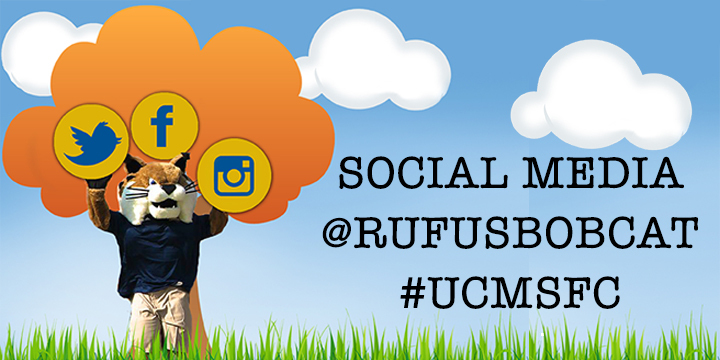 @RufusBobcat Twitter account is where you can find what’s happening right now in the world of UC Merced. Events, celebrations, study tips, educational resources and news, important dates and deadlines and contests. @RufusBobcat Instagram account is a place to explore beautiful images of the UC Merced campus, fun videos of some of our biggest events including Cowchella, Bobcat Day and Commencement. @RufusBobcat Snapchat account is a way to get a glimpse of a day in the life of our students. Since our stories and snaps only last 24 hours, add us today so you don’t miss out on the fun. You can also follow @RufusBobcat Snapchat account to frequently view a #TakeOverTuesday. Most recently, we have traveled to Australia with our study abroad students. When active, you can experience first-hand with our Study Abroad programs on a bi-weekly schedule. UCMercedSFC Pinterest account is collection of boards for study tips, UC Merced news, Dormroom DIYs and Bobcat pride! To view our student staff social media pages, please click HERE.